Geoblock® Standard 5150 (GB 5150) and the Geoblock® Porous Pavement Systems are a series of interlocking polyethylene paving units designed to provide superior load support and turf protection for emergency and utility access lanes, auxiliary parking, golf cart pathways, trails, and other high-use application areas. The Geoblock® system provides vehicular and pedestrian load support while protecting the grass from the harmful effects of traffic. 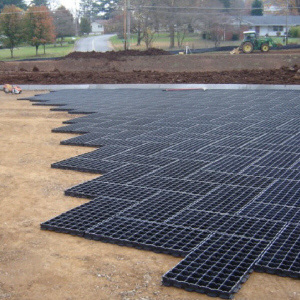 The Geoblock system covers a larger surface area per unit .5m x 1.0m x 50mm (20" x 40" x 2 inch Nominal), reducing costs and increasing ease of installation. The GB 5150 units are 20" x 40" x 1.2 inch Nominal. The system's four-sided tabular, interlocking joint design aids in pattern layout and transfers shear loads from block to block. While some talk about strength per square foot, the structural integrity of the Geoblock® system is built in. The system features a four-sided tabular, interlocking block design that provides superior load-bearing performance and performance and layout design and construction flexibility. The recommended staggered placement (bricklayer’s pattern) of the individual Geoblock units further increases the system’s load distribution capabilities and maximizes the number of adjacent units used to effectively spread concentrated wheel loads over the largest possible area. Click here for online videos, articles, and much more.